Habit Canavalia rosea grows as long-lived perennial vine climbing and rambling up to 15 meters in length. The trifoliate leaves are arranged alternately, with the leaflets to 8 cm in length, ovate to oblong to lanceolate, with a rounded/retuse leaf apex and entire margin. The zygomorphic, perfect, complete flowers are arranged in axillary and terminal racemes. The calyx has 5 greenish fused, sepals forming 3 sections.. The corolla has 5 pink to purple, unfused, petals in which the largest is to the top of the flower forming a reflexed banner. There are 10 stamens in which 9 are fused and the 10th to the top is separate. The ovary is superior with a single locule. The fruit is a brown legume at maturity that is slightly compressed between the seeds. 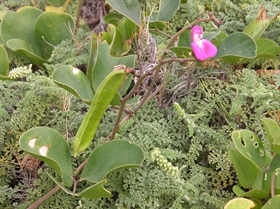 Distribution in Bahamas/Globally: Canavalia rosea grows in the Bahamian Archipelago, Caribbean, Florida and Mexico. 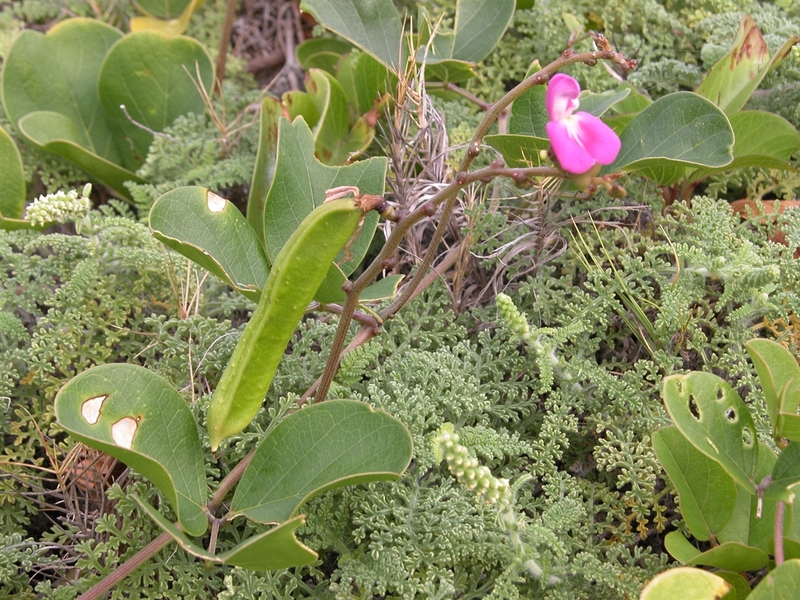 Medicinal/Cultural/Economic usage: Canavalia rosea is not used medicinally in the Bahamas. The beans when well roasted are edible and can be added to coffee. The vines are good for trellis’s and grow fast in coastal conditions.